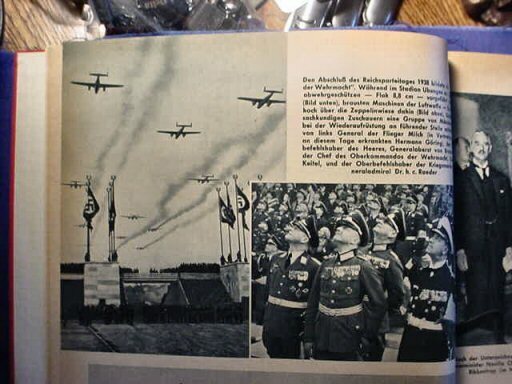 DESCRIPTION: This set of two books entitled The Second World War in Pictures was published in Offenburg (Baden) by Dr. Franz Burda only 7 years after the tragic end of WWII. 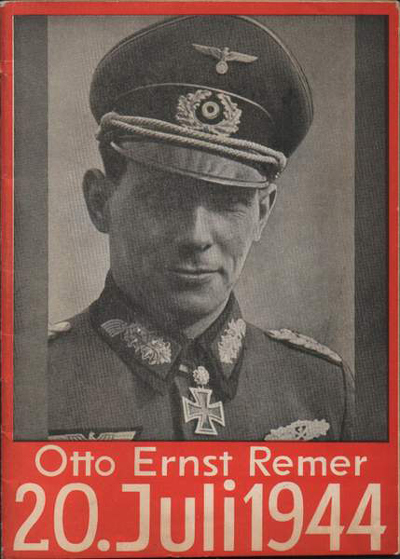 The books are very rare today and still remain the most complete pictorial record ever produced on WWII. 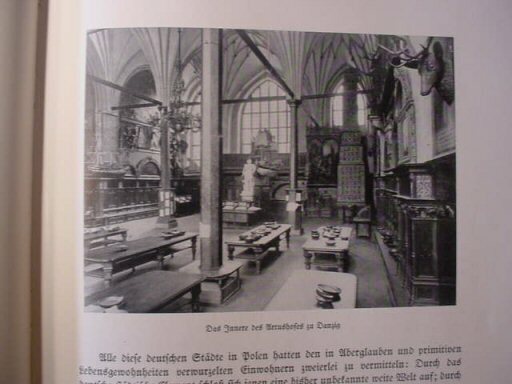 The books are comprised of hundreds of clear, concise photos. 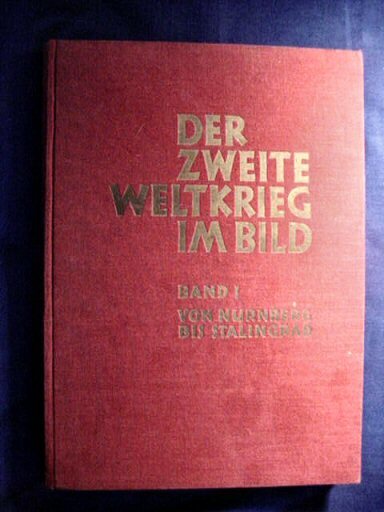 The first volume, Von Nürnberg bis Stalingrad, covers the beginnings of the war up to the European tragedy at Stalingrad. 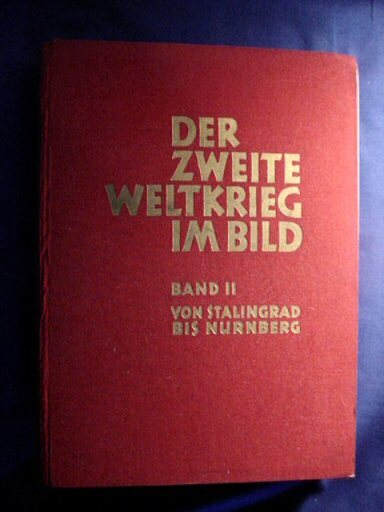 The second volume covers the beginning of the end at Stalingrad to the courtroom for the “Star Chamber” proceedings at Nürnberg. 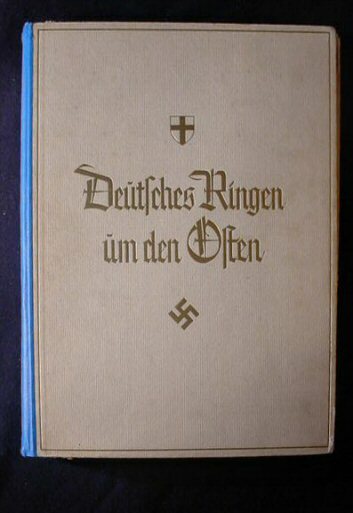 This volume is called Von Stalingrad bis Nürnberg. 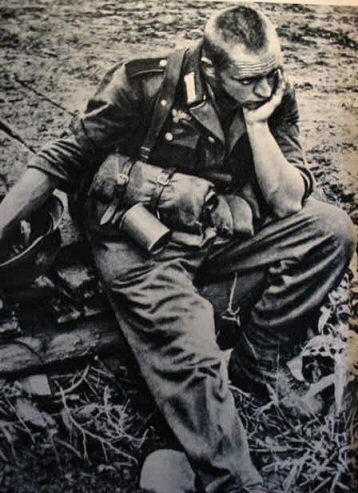 We could wax poetic about these great books, but since a picture is worth a thousand words, so they say. These books in historical content should be worth “millions,” but are priced very reasonably. 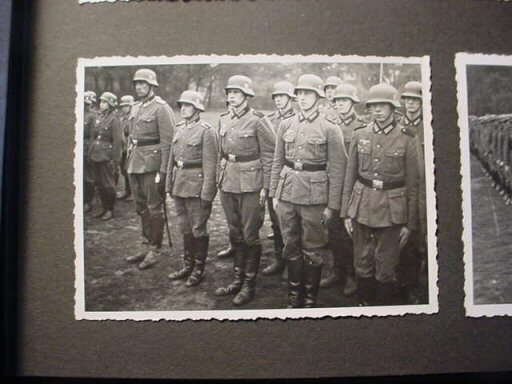 They measure 9 x 12 inches. 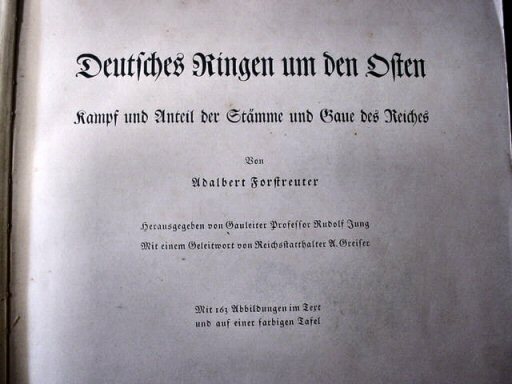 The first volume is composed of 270 pages, while volume 2 has 271 pages. 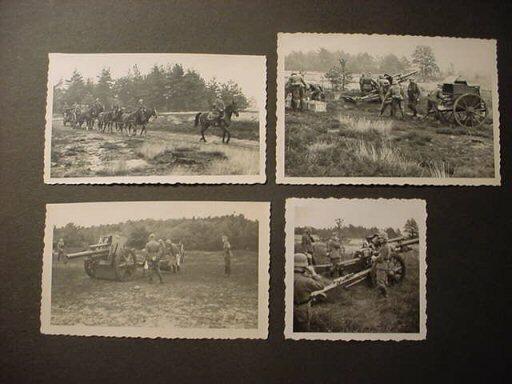 They are in remarkably fine condition throughout. 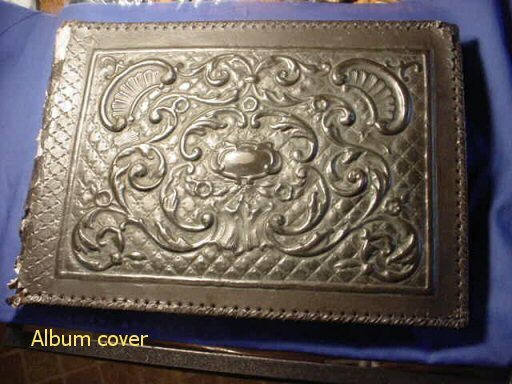 This set does not have the original dust covers. 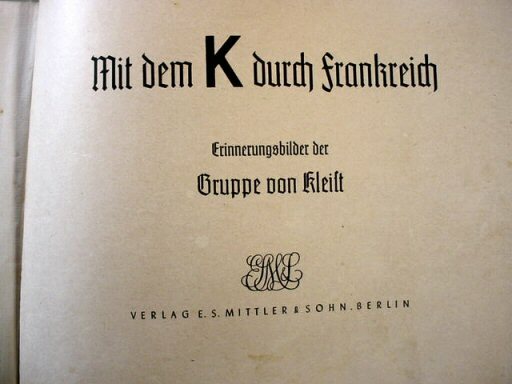 The books are in the German language. 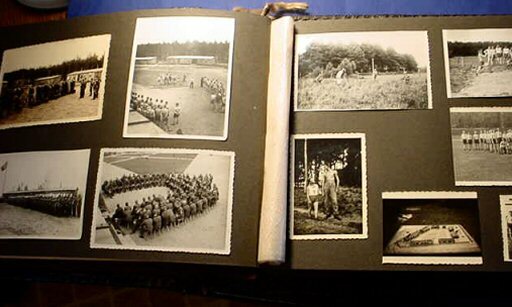 DESCRIPTION: This is one great album that traces a solder’s military career and experiences with about 165 great pictures in various sizes as is usual in these albums, but what is not usual is that this album has no missing pictures and unlike 95 percent of German wartime albums, there are not dozens of pictures of geographical areas and scenery. 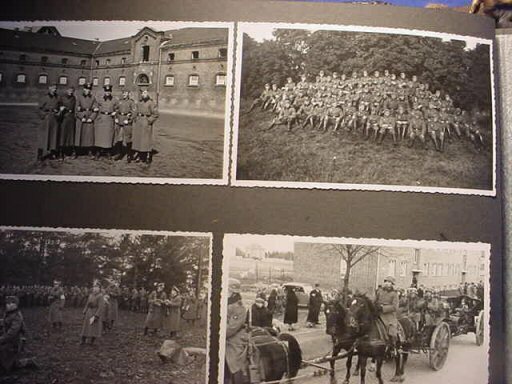 Almost every photo is of soldiers, equipment, ships, horses (yes) horses. 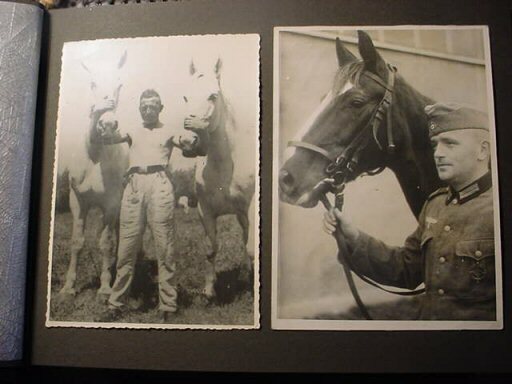 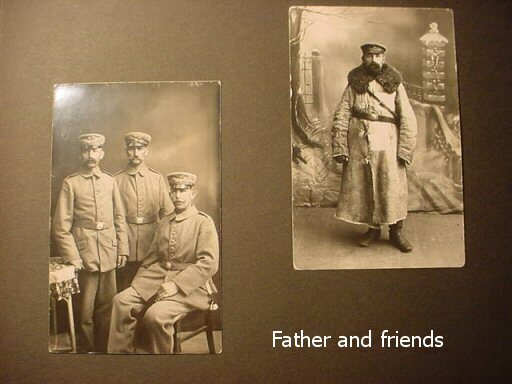 There are so many equestrian pictures that we think this man was probably in a horse-drawn artillery unit or actual cavalry “great horse pics.” As usual, the soldier begins his album with relatives who were in WWI units (possibly his father among them). 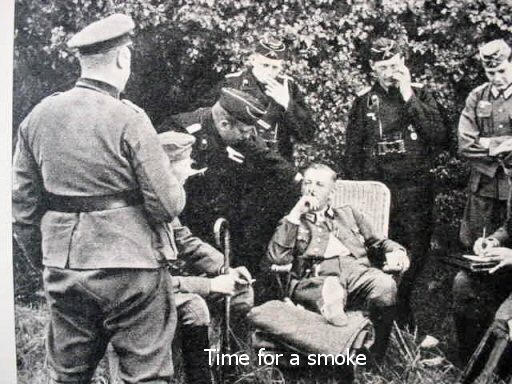 The rest of the album is WWII. 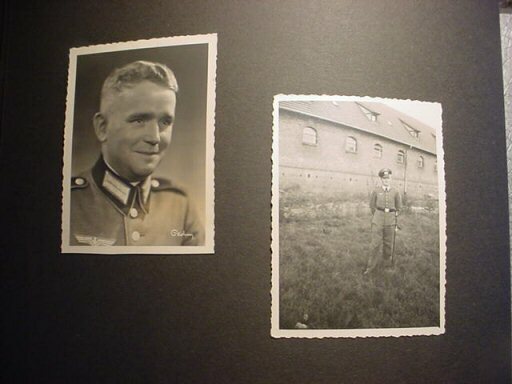 Many of the photos are 3 x 4 inches, but there are smaller and bigger ones, as well. 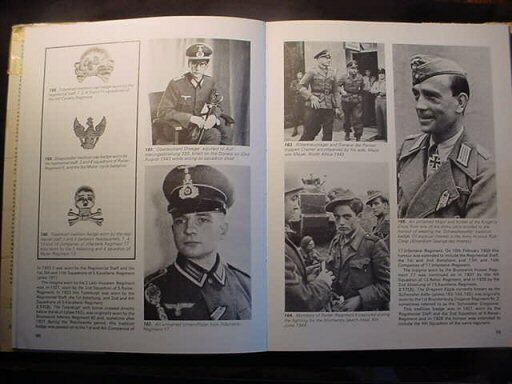 The pages and pictures are all in super shape. 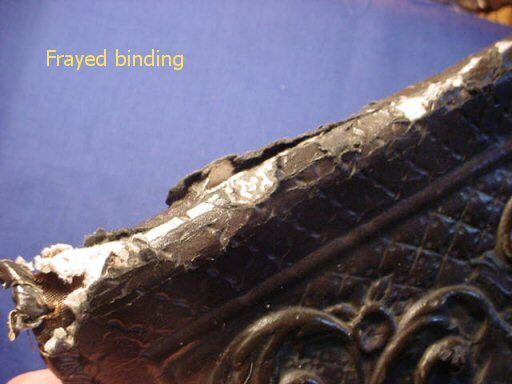 The cover is in leather and is quite frayed at the bound edge, but holding. 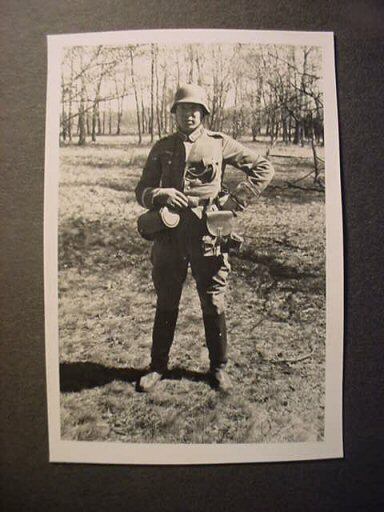 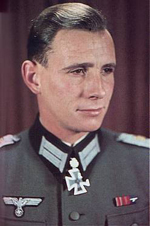 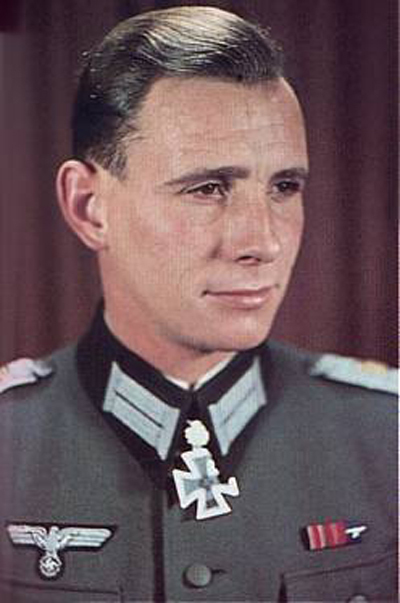 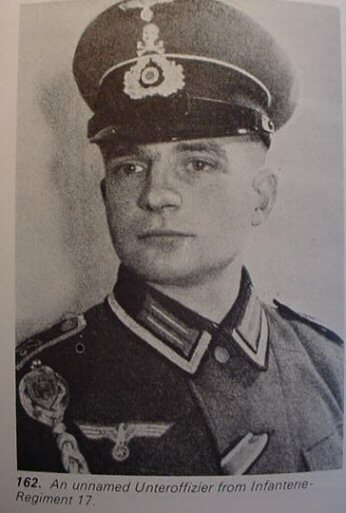 The picture of this soldier is in the front page and you will see him in many of the pages within with his friends, and Treue Kameraden. 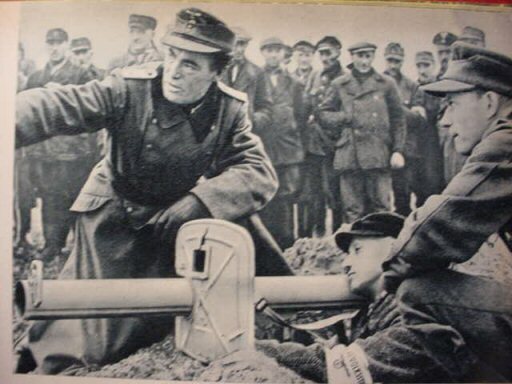 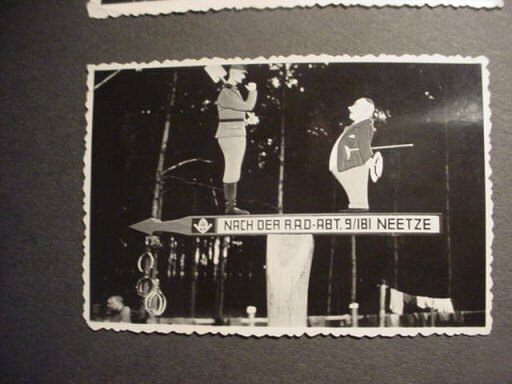 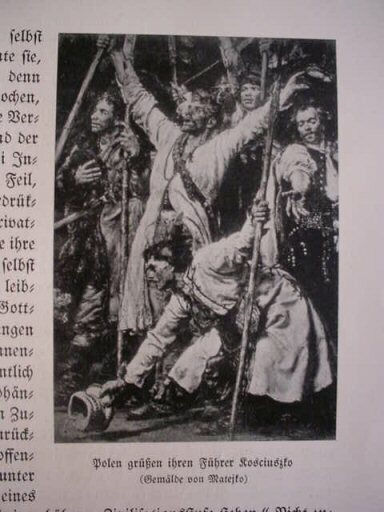 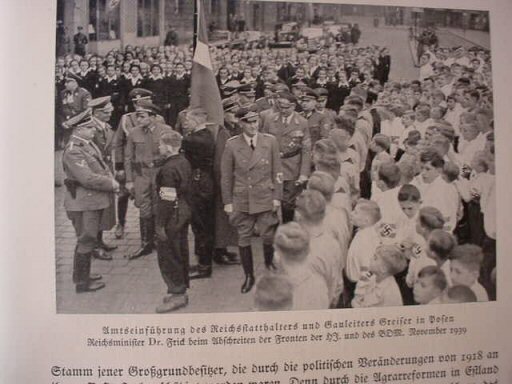 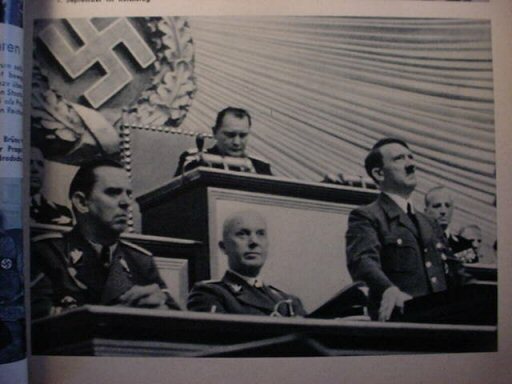 The saying under the first picture of him proclaims: “Im Glauben an Deutschland werden wir das Schicksal meistern,” “We believe that it is the fate of Germany to be the Master.”. 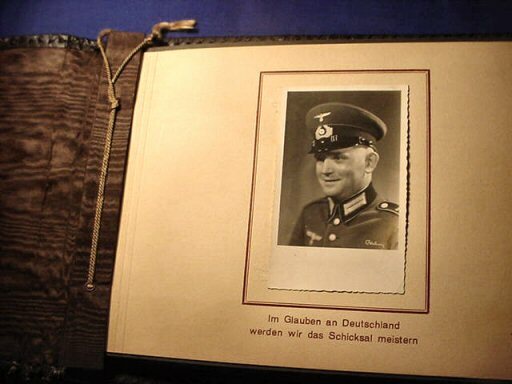 The album measures 14 x 16 inches and is one of the best archival records we possibly have ever seen or handled. 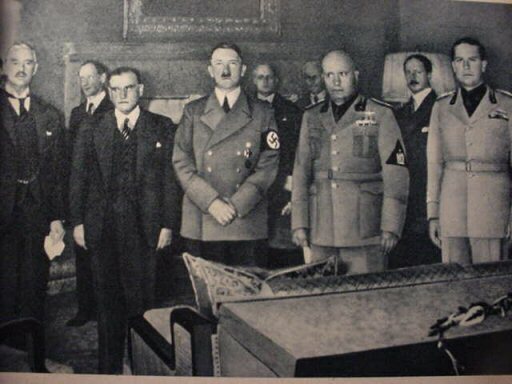 This is a fascinating history in pictures. 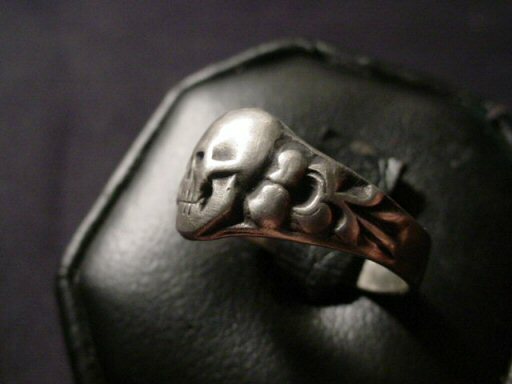 DESCRIPTION: These skulls in genuine fine silver are highly detailed and marked clearly (‘800). 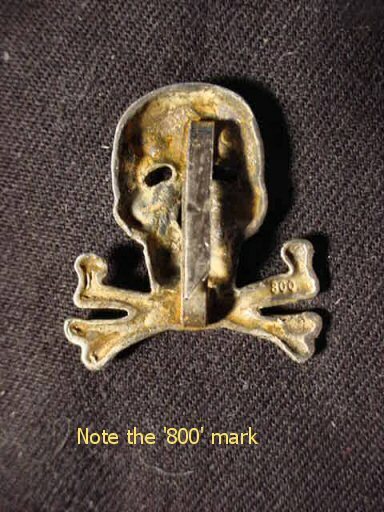 The designation number can be found stamped at the edge of the right cross-bone extensions. 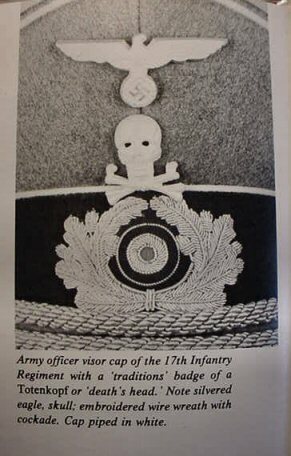 The badge was to be worn between the National Service Eagle and the wreath with cockade on the officer’s cap of the 17 the Infantry Regiment. 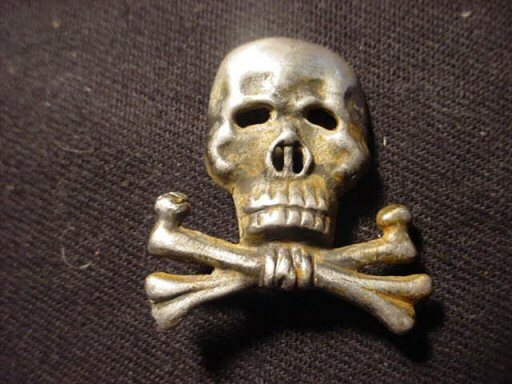 This a traditions badge death’s head. 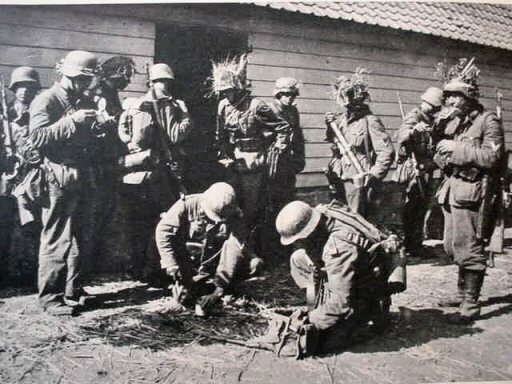 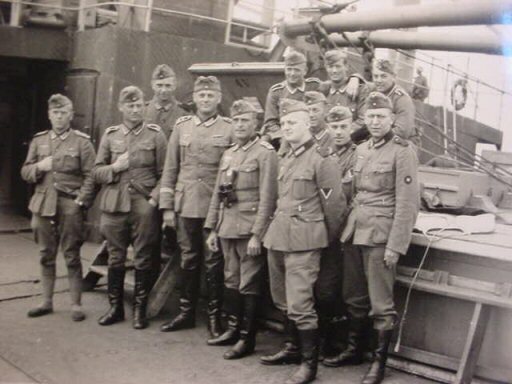 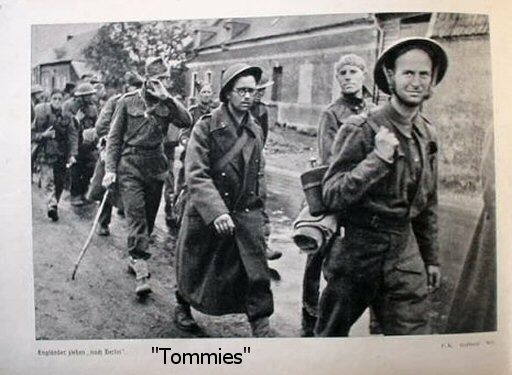 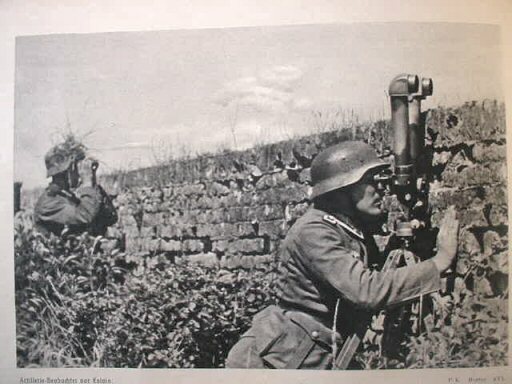 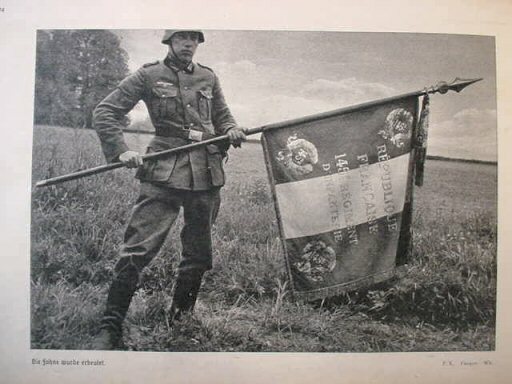 The 17th was an elite group of Sturmtruppen (Storm Troops in WWI) and their legend went on in WWII. 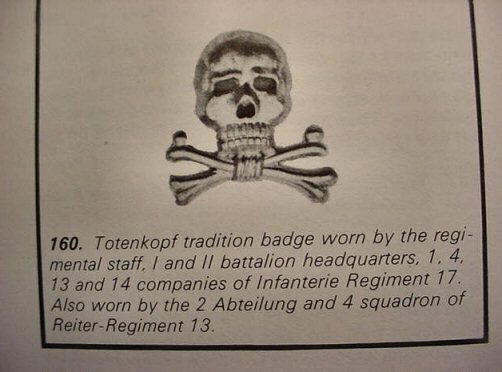 The insignia of the 17th as elite front-line, tough combatants was the skull on their flags during the Freikorps period as well. 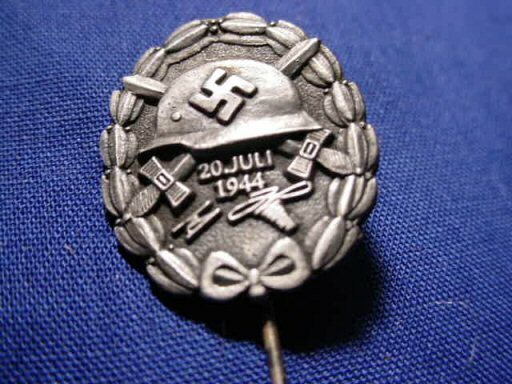 The badge is scarce even in zinc or white metal. 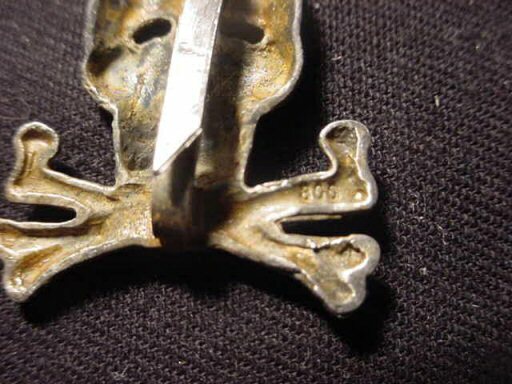 It is bout 1 inch tall and 1 inch across the cross bones. 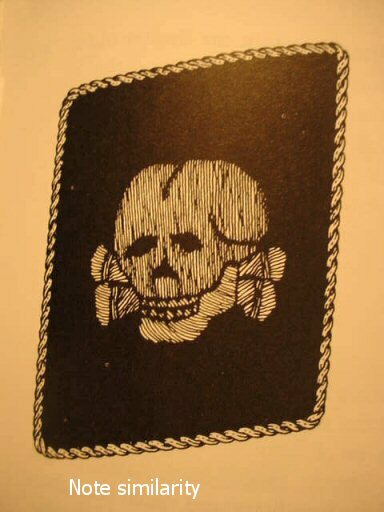 This is a very fine and scarce insignia of elite troops of both wars. 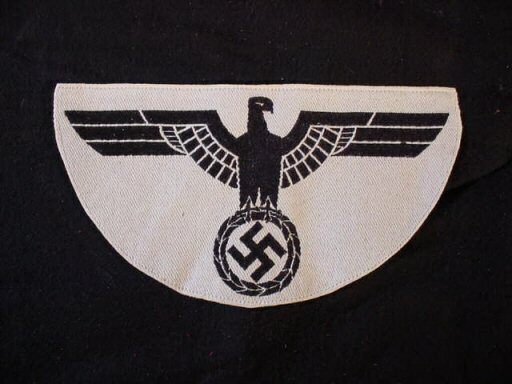 DESCRIPTION: Always impressive this is the official sport-shirt patch for the German (Das Heer). 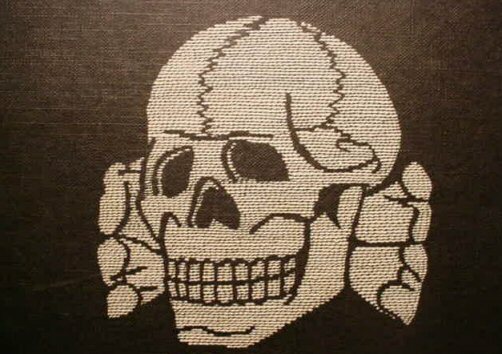 It is edge sewn and ready for application to the shirt. 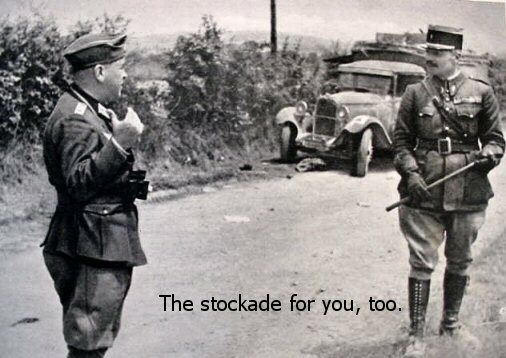 It’s in very fine condition. 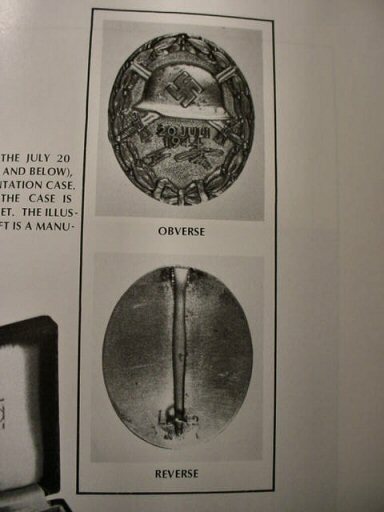 It measure 9 inches long and 5 inches top to bottom. 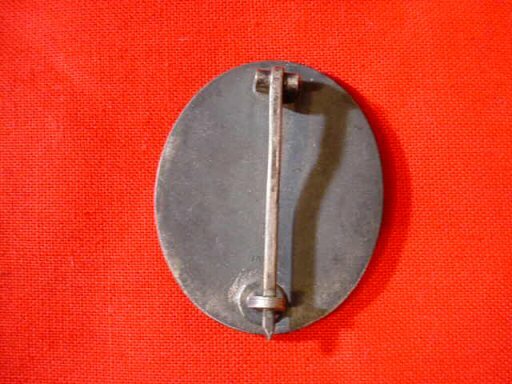 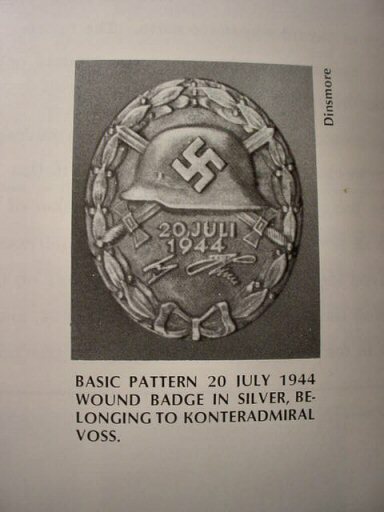 DESCRIPTION: Here is the silver Wound Badge in very good condition. 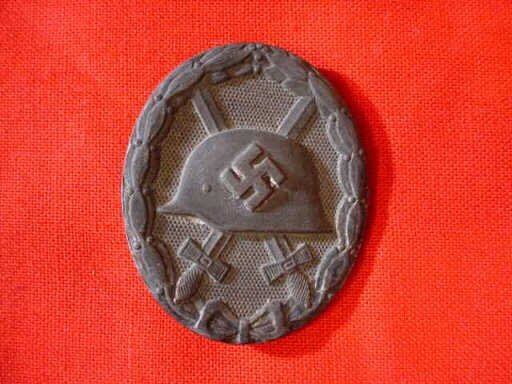 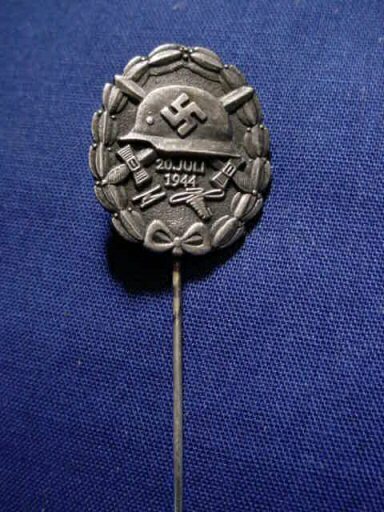 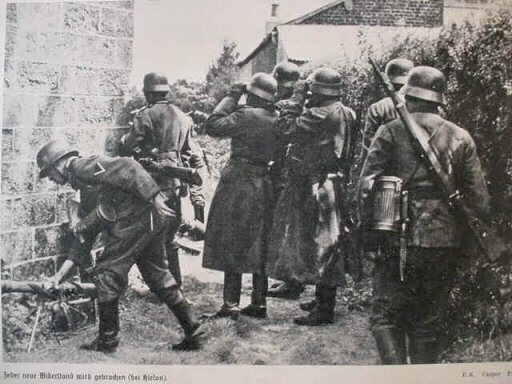 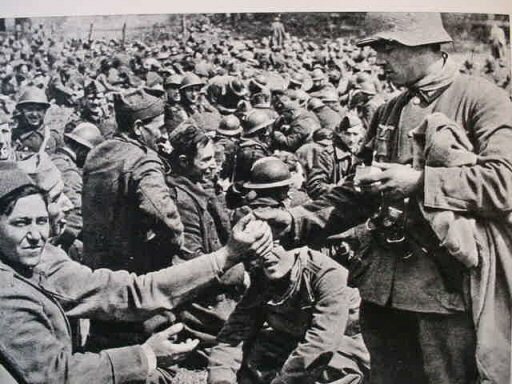 Adolf Hitler ordered the reinstitution of the Verwundeten Abzeichen for German volunteers who received combat–related wounds in the Spanish Civil War and then with the outbreak of European hostilities on September 1, 1939, Hitler again reinstituted the Wound Badge effective that same date. 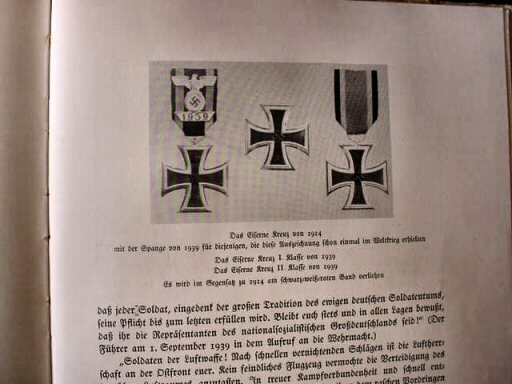 The award in black metal was for one or two wounds, silver for three or four wounds, and gold for 5 or more. 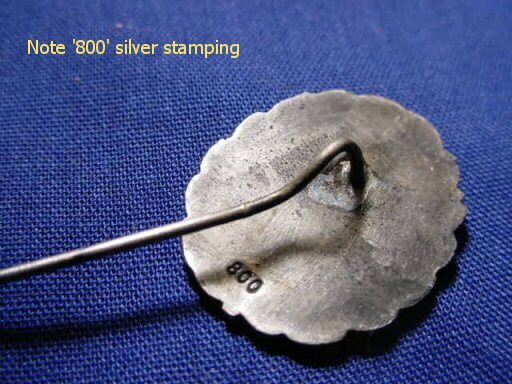 In this case the one we offer is in silver metal (not genuine silver). 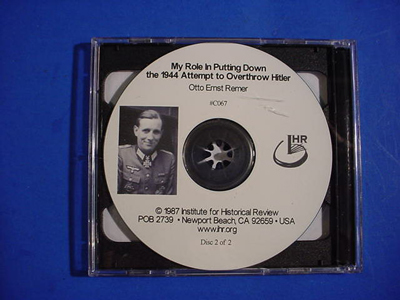 It measures 1 3/4 x 1 1/4 inches. 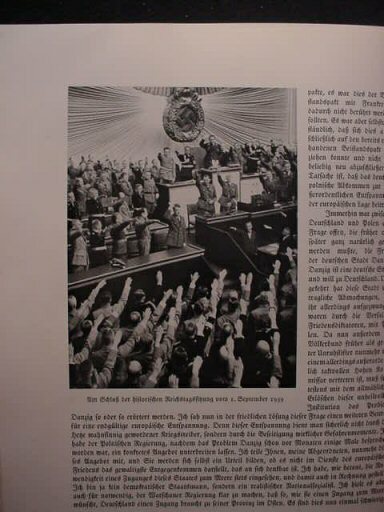 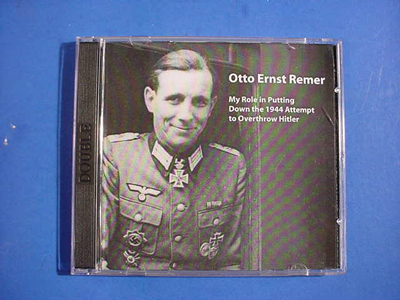 DESCRIPTION: This is a really great book for those interested in the glory days of the Third Reich. 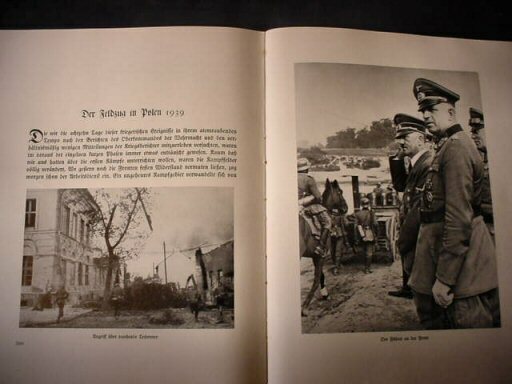 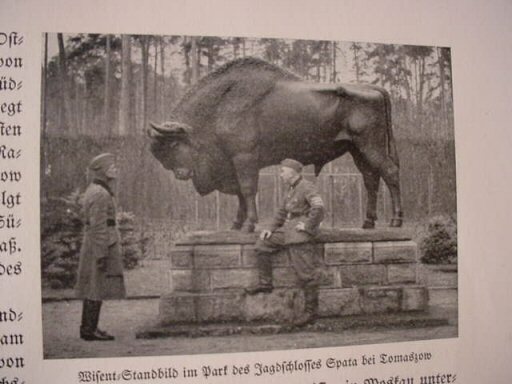 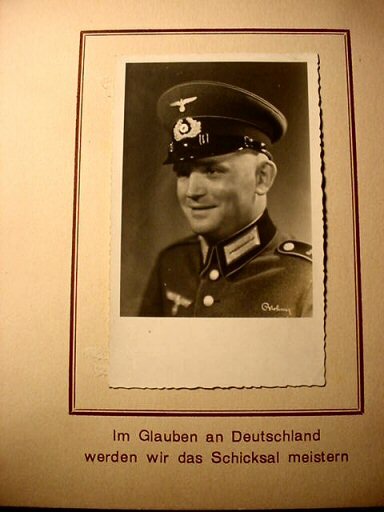 The book is a photographic synopsis of the early WWII exploits of General of Cavalry Ewald von Kleist and others, such as Guderian and Hoeppner and their valiant soldiers as they stormed across France The book consists of 243 pages, 98 percent of which contain 8 x 5 1/2-inch size pictures of all the action, the leaders, the battles, the guns, and the enemy prisoners; some of them quite ludicrous looking compared with the dashing Heerssoldaten of the Wehrmacht. 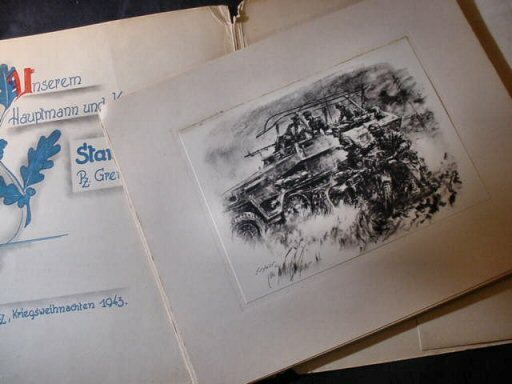 DESCRIPTION: Here is what I perceive to be an absolutely great assemblage of fantastic art prints--21 in all—assembled in a decorative folder made to accommodate them. 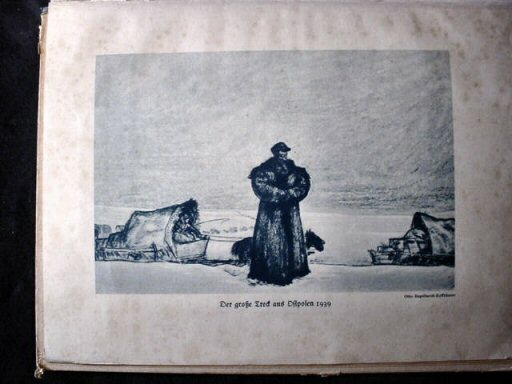 The prints measure about 8 1/4 x 6 inches and are individually mounted on heavy vellum paper stock. 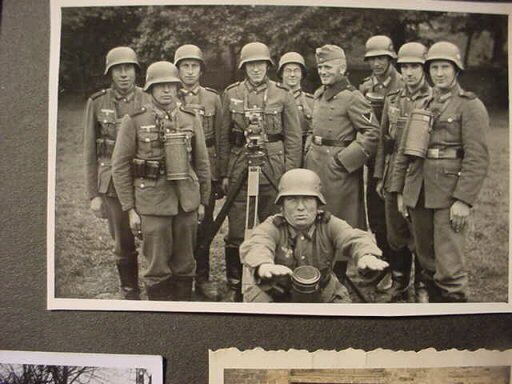 Some are in color, but everyone of them is a masterful and realistic depiction of the war in the east. 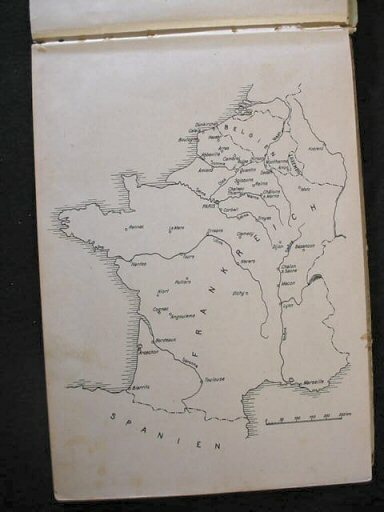 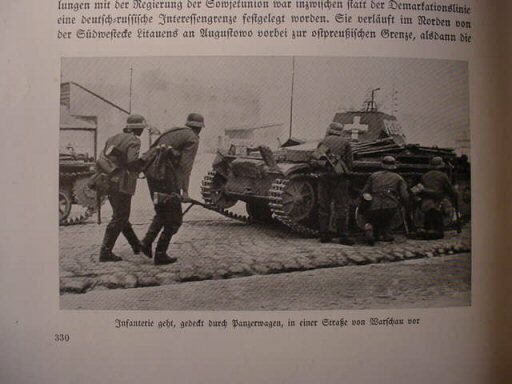 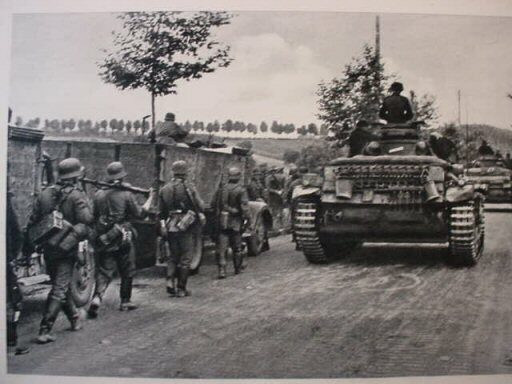 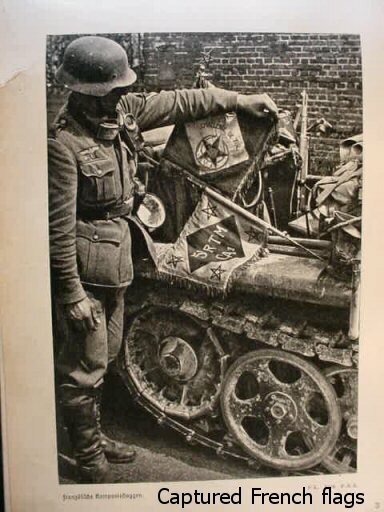 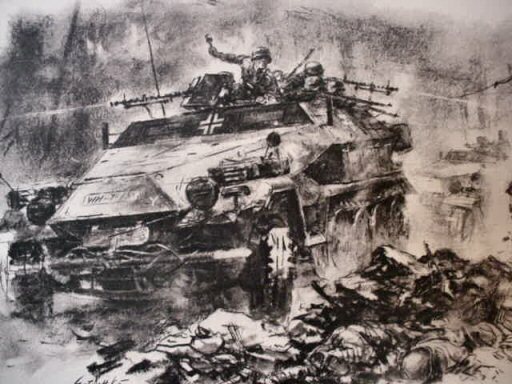 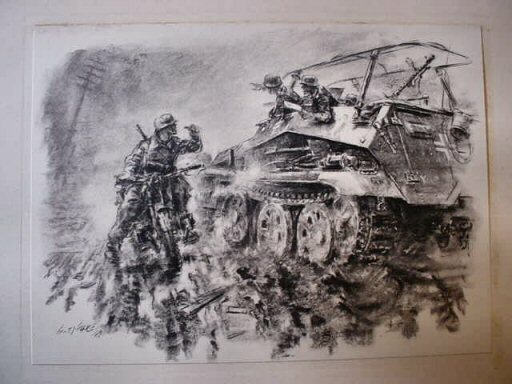 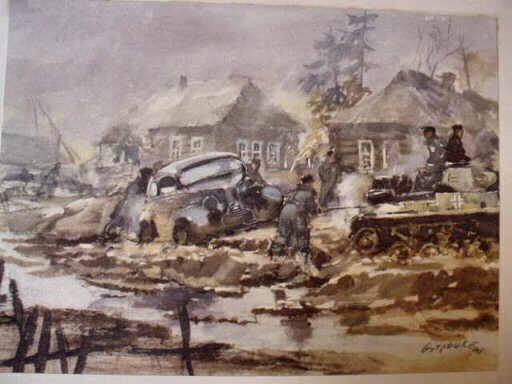 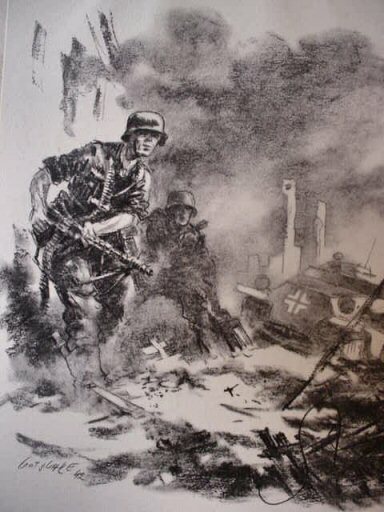 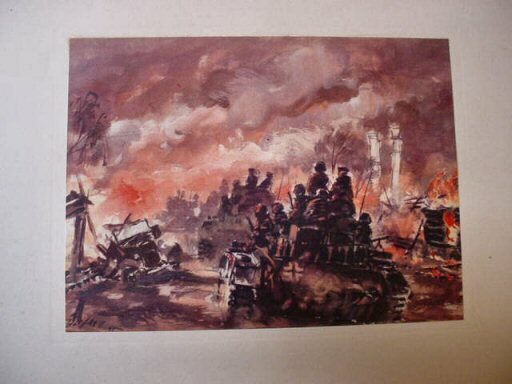 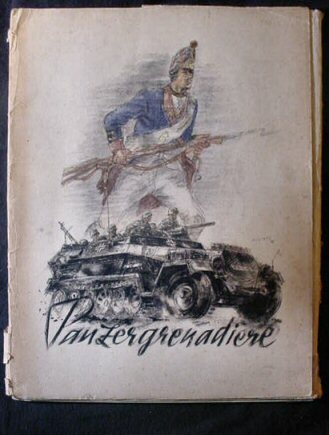 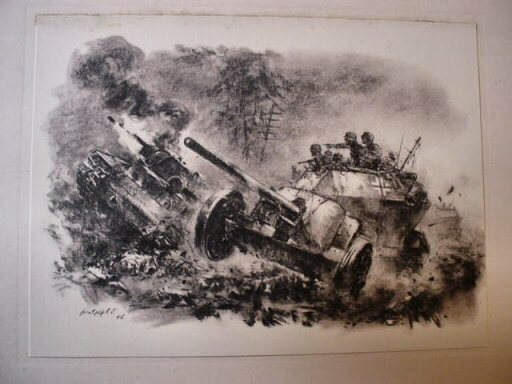 The name of the folio is Panzergrenadiere and the subjects covered in the drawings are depictions of tanks, armored vehicles, and grenadiers (soldiers) in their battle for Europe. 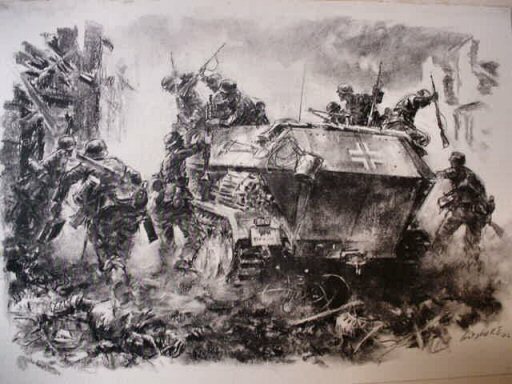 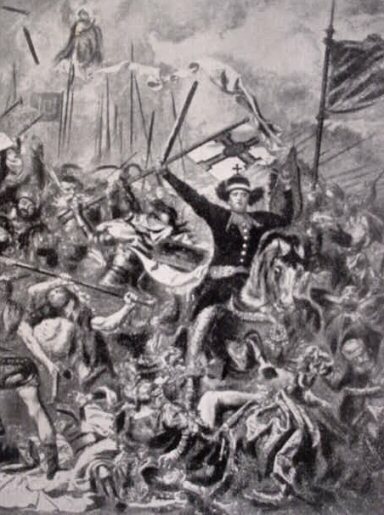 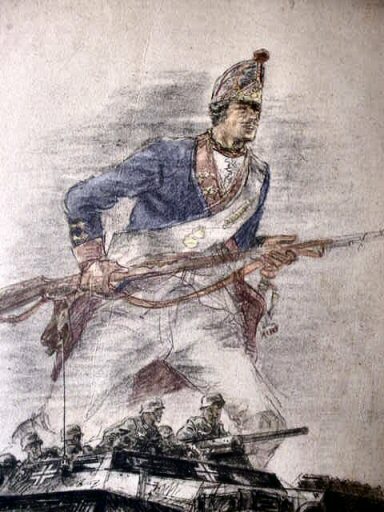 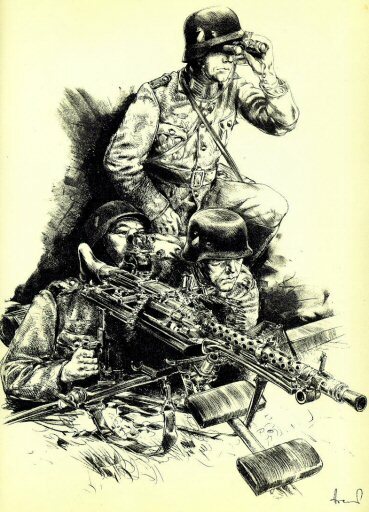 The cover to me is most interesting as it shows a grenadier of the era of Frederick the Great as he advances with bayonet and musket, while directly underneath is the Panzer halftrack rushing to battle carrying the new grenadiers. 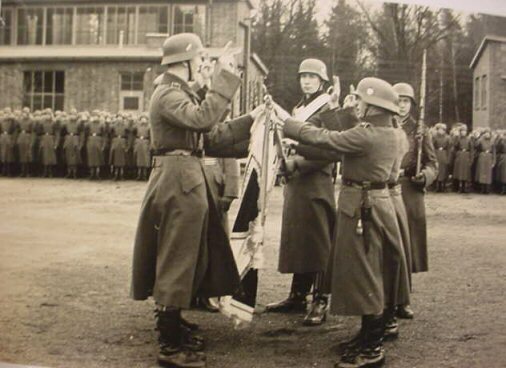 The folio, or Mappe, is presented to the company chief and captain at Gleiwitz in the War Christmas in 1943, by the Stamm.-Komp. 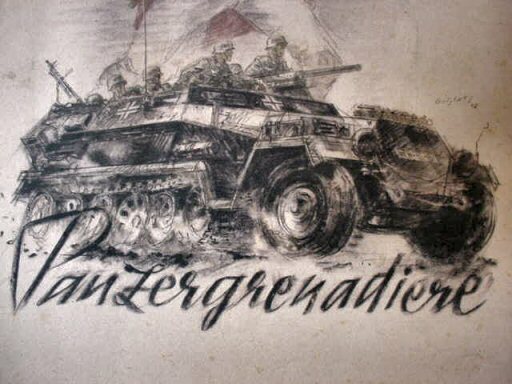 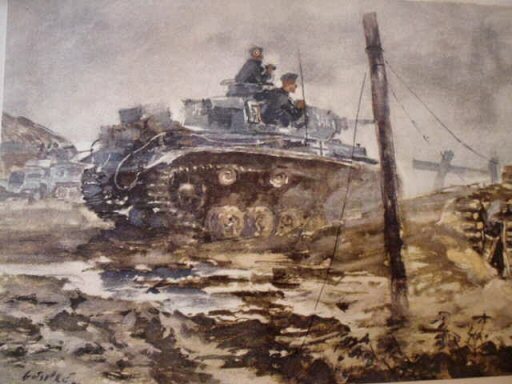 Panzer Grenadier Regt 110. 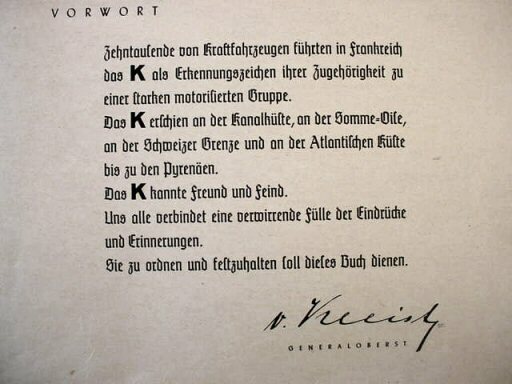 The presentation is accomplished by hand calligraphy. 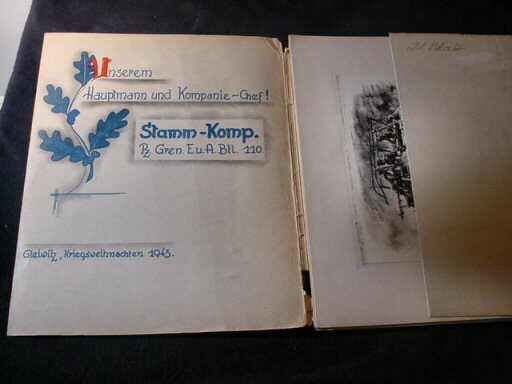 There is some wear to the cover’s edges, but the prints are all in perfect shape. 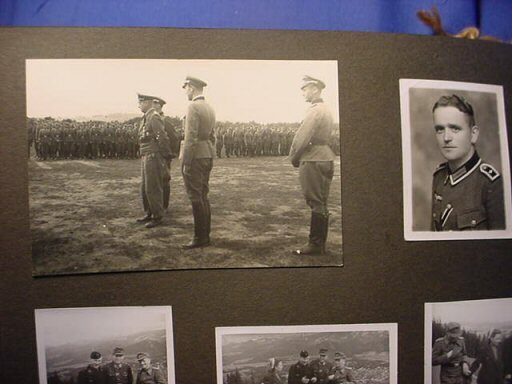 Gleiwitz, the place where this presentation was made, is possibly the place where WWII started. 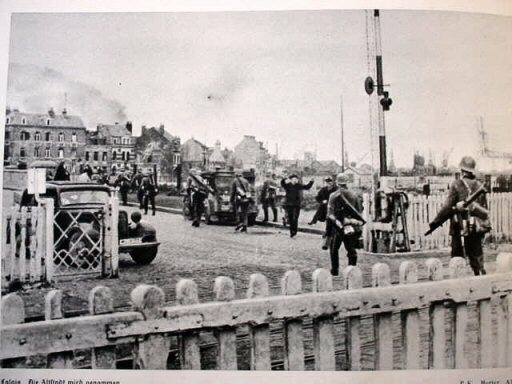 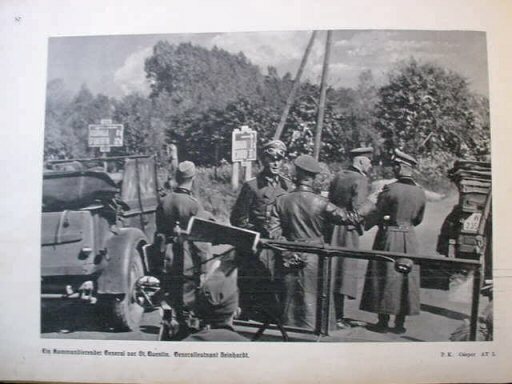 This is where the German radio station was attacked by Polish troops killing the radio operators. 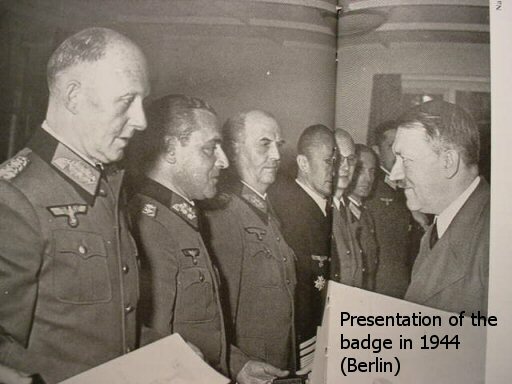 The usual liberal anti-German writers say this was staged by SS officers Alfred Naujocks, Heinrich Müller, and Reinhard Heydrich. 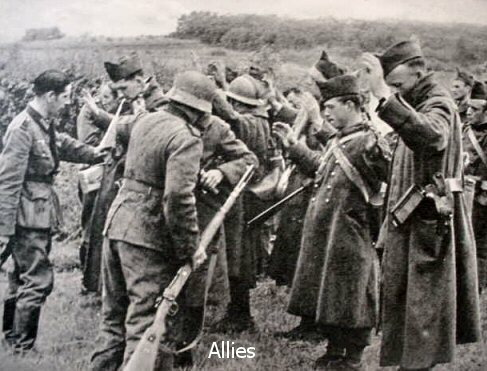 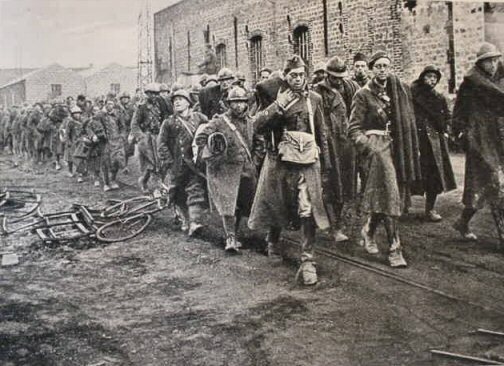 The announcement to the Poles living in Silesia was to strike against the Germans; and strike they did. 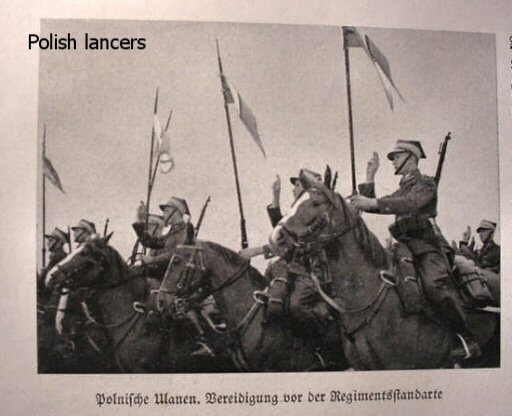 There were terrible massacres against the German minority all through Poland. 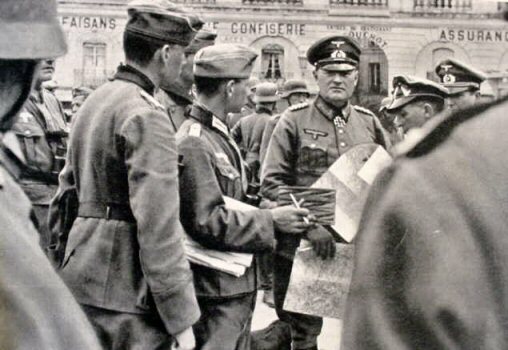 Yes, on all the web sites you will see the information that it was an elaborate Nazi plan to have an excuse to invade Poland, but there is another side, and if you are interested enough possibly you should look into it. 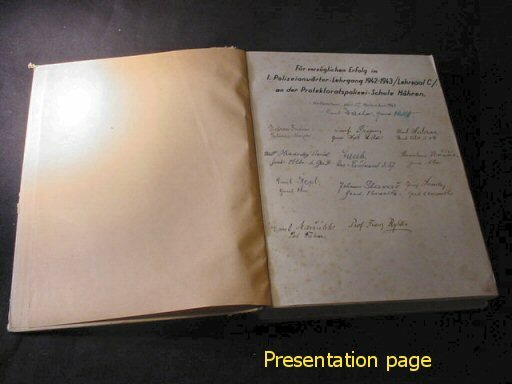 Usually, the winners write the history at for the next 100 years after a war. 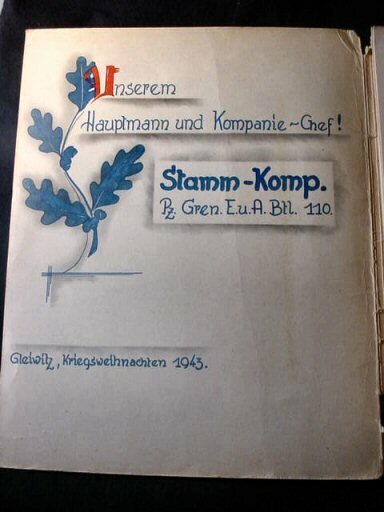 DESCRIPTION: Here is one great book that spells out the German agenda of Lebenstraum. 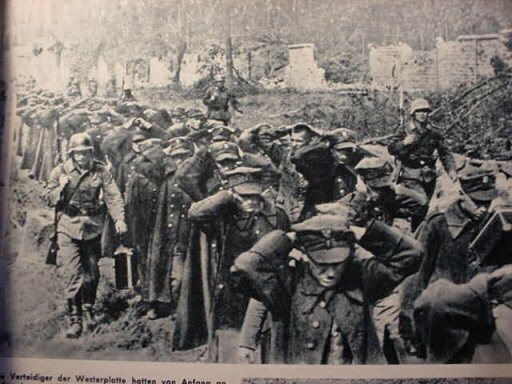 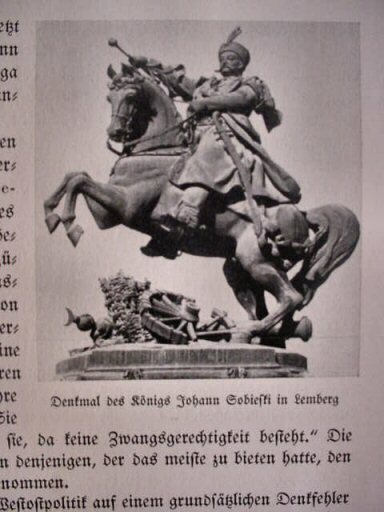 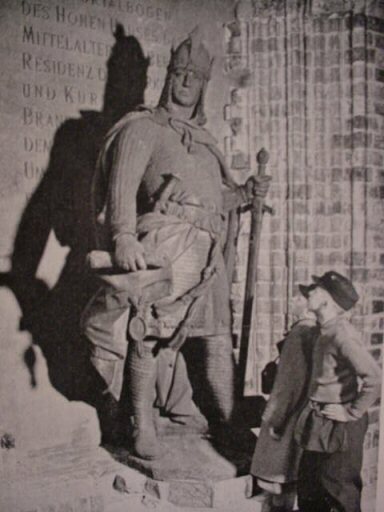 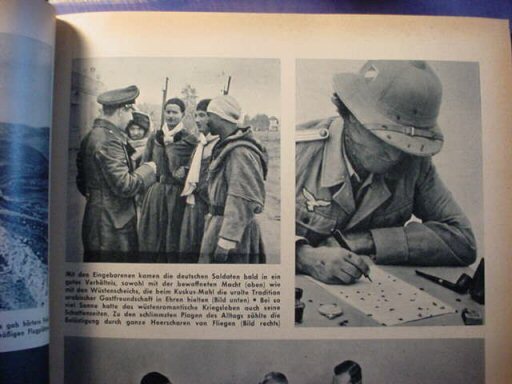 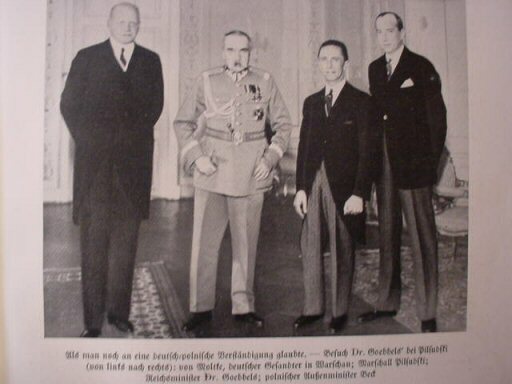 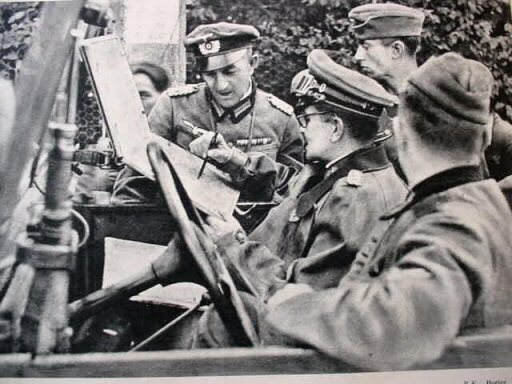 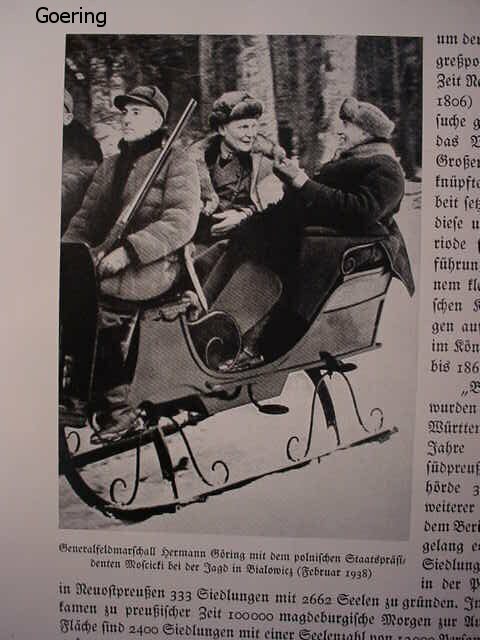 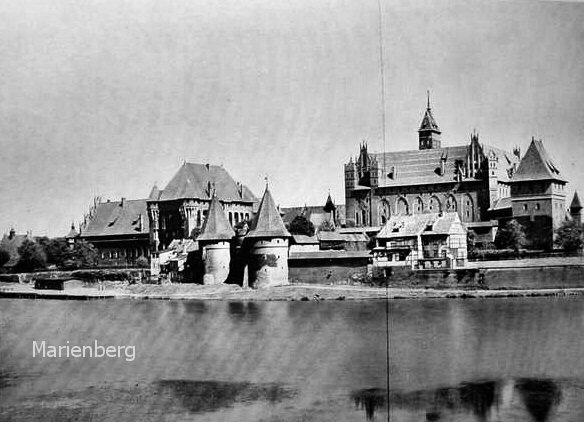 There are 163 fine black-and-white pictures and text tracing Germany’s expansionist aims from the time of the Teutonic knights at Marienburg to the Russo-German Pact of 1939. 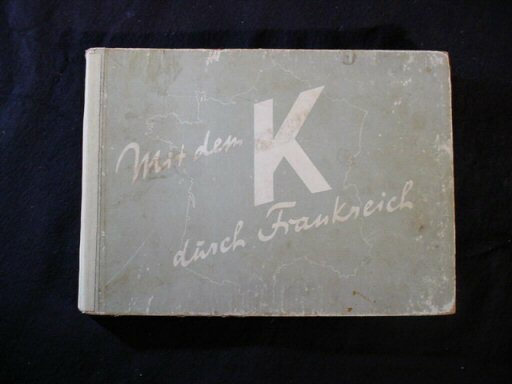 The book was presented as a congratulatory prize from the teachers and classmates to a student they wished to honor. 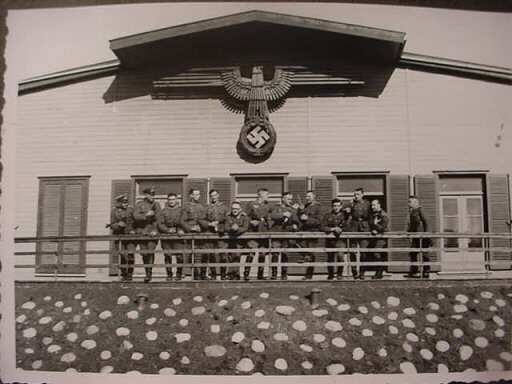 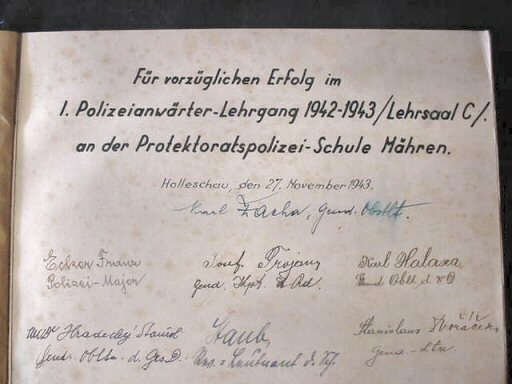 The school is the First Police School Class C of 1942-43 at the protectorate police establishment in Moravia. 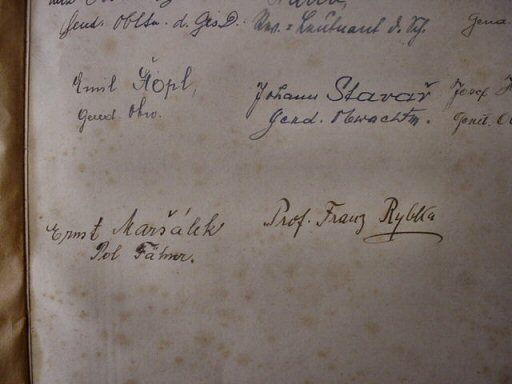 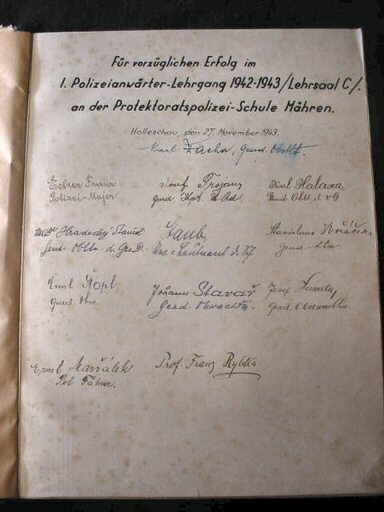 The signatures are all Czechs, who worked as policemen for the German liberators in the 1940s. 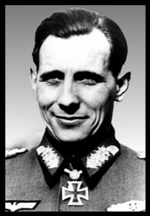 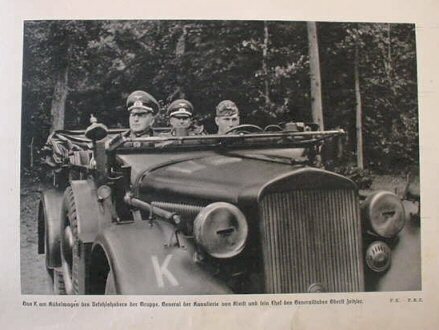 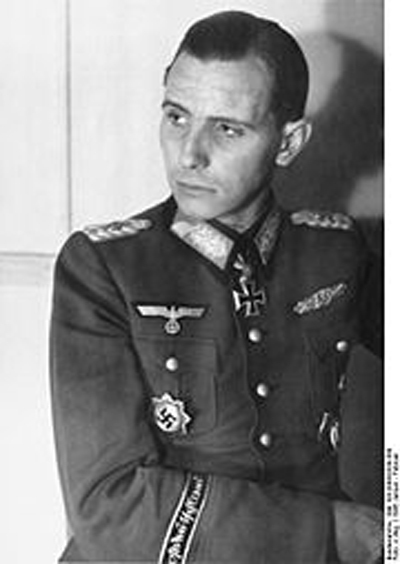 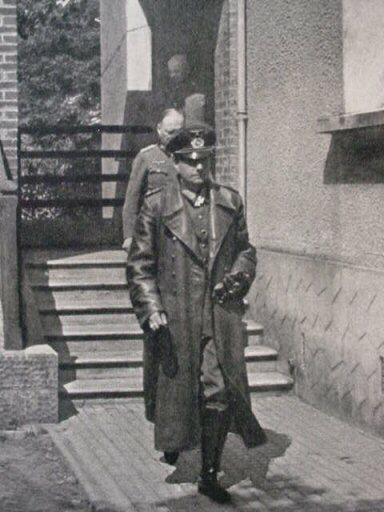 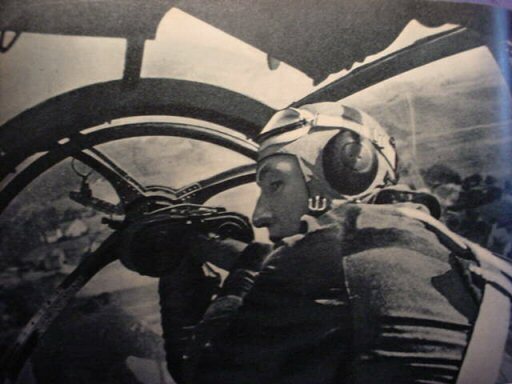 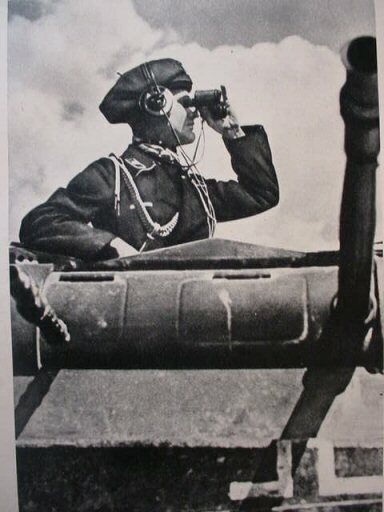 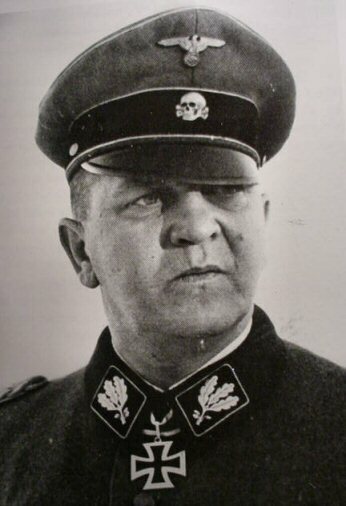 The chief policeman and Reich protector of Bohemia and Moravia in former Czechoslovakia was none other than Obergruppenführer-SS Reinhard Tristan Heydrich. 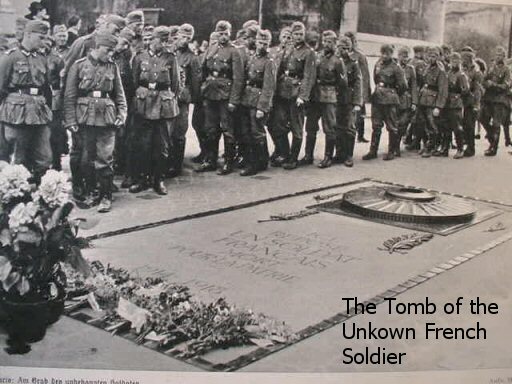 He was murdered by British-trained assassins on May 27, 1942. 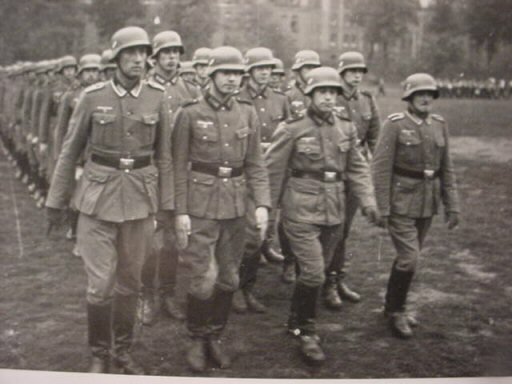 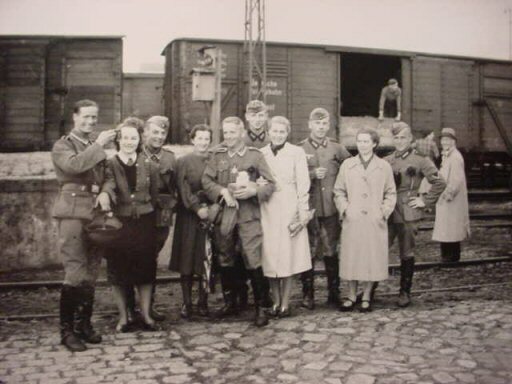 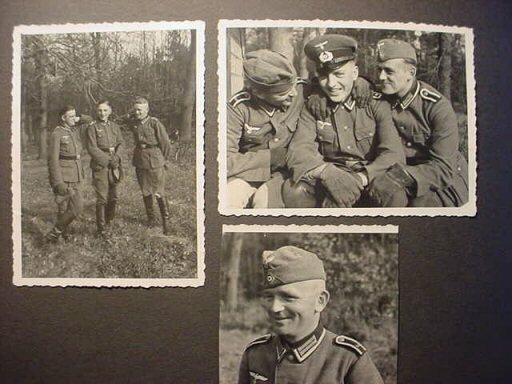 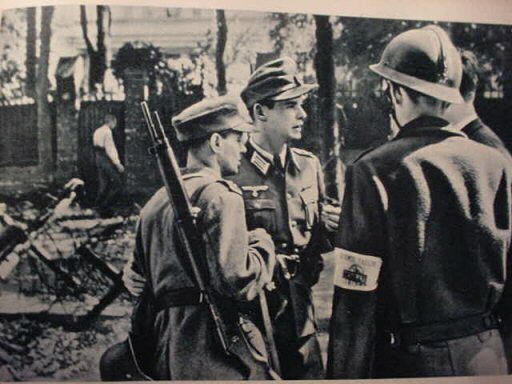 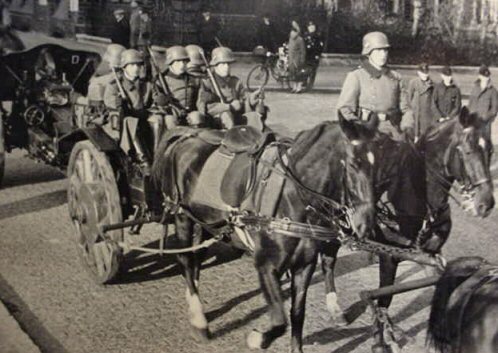 Many Czechs served in the German police formations fighting against the Czech communist resistance movement. 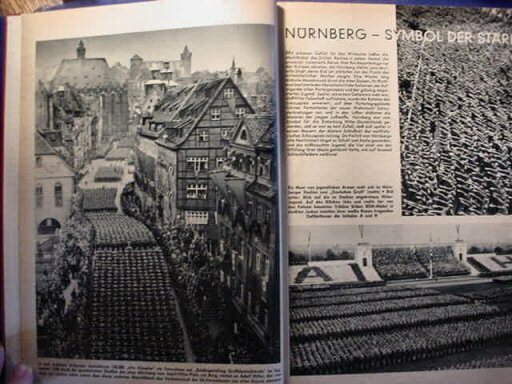 The book has 355 pages and measures 9 x 11 1/2 inches and is in very good condition. 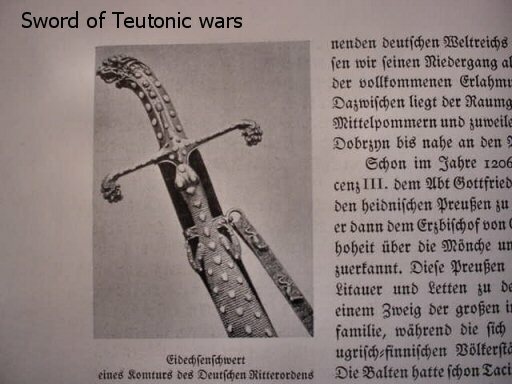 This is an extremely important historically and considered rare, even in Germany. 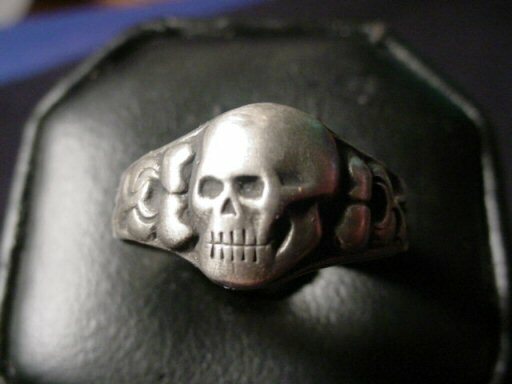 DESCRIPTION: This is a ring that may well be a “West Wall ring.” This style, among other motifs, was commonly worn by soldiers of the West Wall (Siegfried Line). 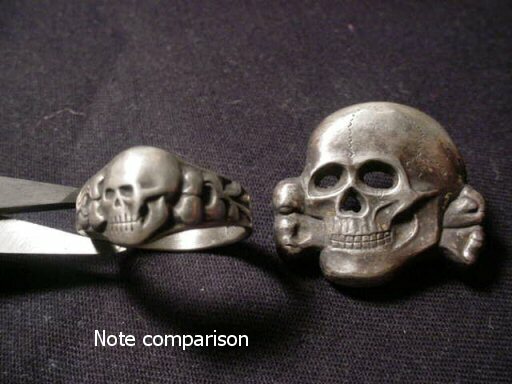 The angle of the skull, unlike so many skull-decorated rings of the German services, looks to the left when viewed. 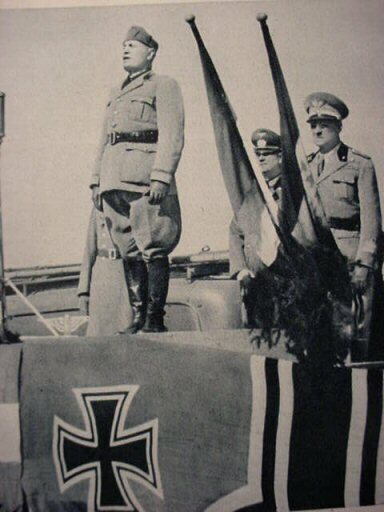 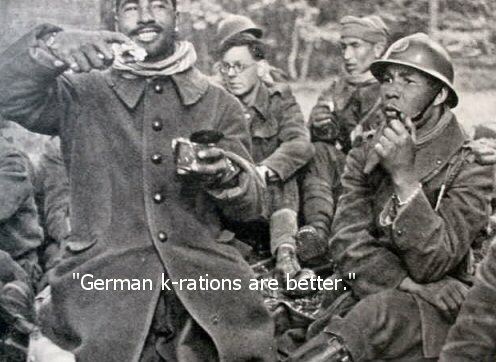 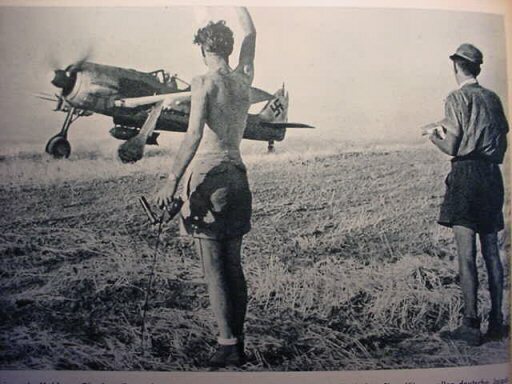 This is why we feel that it might be the style for the alt="Wehrmacht". 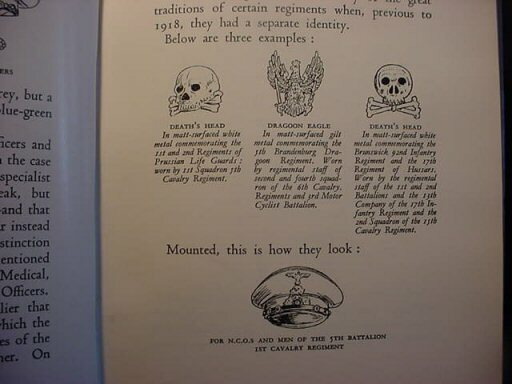 Note in our pictures that the SS skulls of the second type look to the left and are very definitely not looking straight at you. 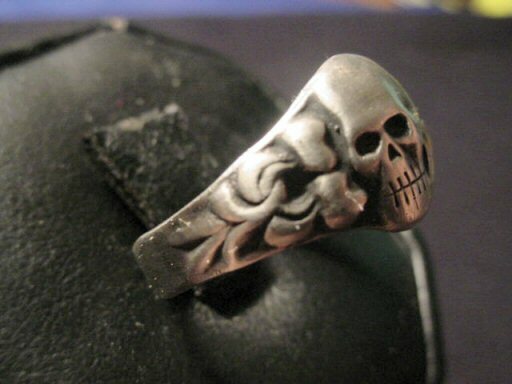 The floral design at the sides is usual on West Wall rings. 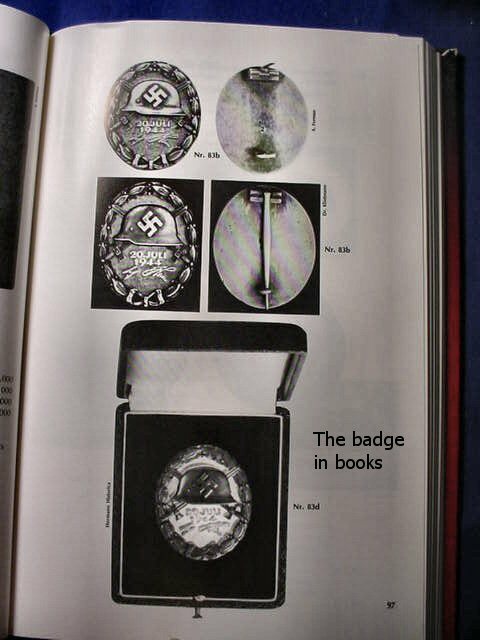 The ring probably was not exclusive for the SS, but there is a probability that because of its design it may well have been favored by them. 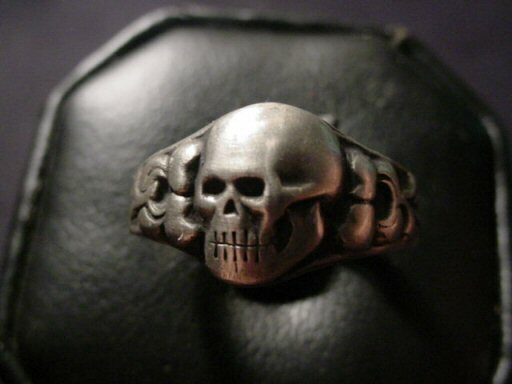 This is a good-looking elite-forces ring, in any case.